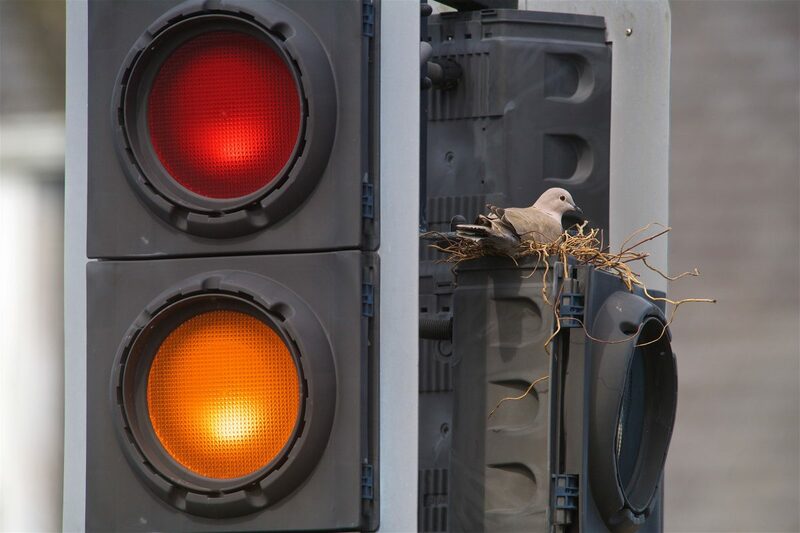 These pictures show a pedestrian ”dove crossing” created after a bird made a nest – on top of a set of traffic lights. The alternative to the traditional pelican crossing was built when the dove ignored all surrounding trees and countryside to nurture her chicks on the side of a busy road. Animal welfare charity the JSPCA said it could be in situ for up to ten weeks until they learn to fly – and urged the public not to disturb them and let nature take its course. The collared dove has bemused onlookers in St Ouen in Jersey since it was first spotted on Monday with man not able to fathom why she chose a set of traffic lights outside the parish hall to hatch her newborn. Babs Keywood, spokesperson for the JSPCA said: “The doves have chosen to nest there and we would not disturb the nest unless we thought the babies would come to any harm. She said that once built the nests can remain for anything up to ten weeks and confirmed they were first made aware of its presence on Monday. She added: “We just want to advise people not to disturb them or put them in danger – and let nature takes its course. “Mum will be teaching them how to fly and as soon as they are old enough they will fly off. “The surrounding area has plenty of trees so why she has nested there instead of a tree in a safe area we are not sure. “They do pick areas that are high up so maybe she thought this was similar to a tree. “There is no specific danger due to where she has picked but hopefully people won’t intervene.